Hi everyone, If you’ve given any thought to coming along on this tour – now is the time to let me know – lot’s of learning with lots of interesting, fast moving photography subjects!! Please note – the entry fee online into ‘Wings over Illawarra’ is $42.50 per adult and $35 per pension card holder. Do you love airplanes? Stunt airplane displays? Vintage cars? Freestyle motor cross displays? 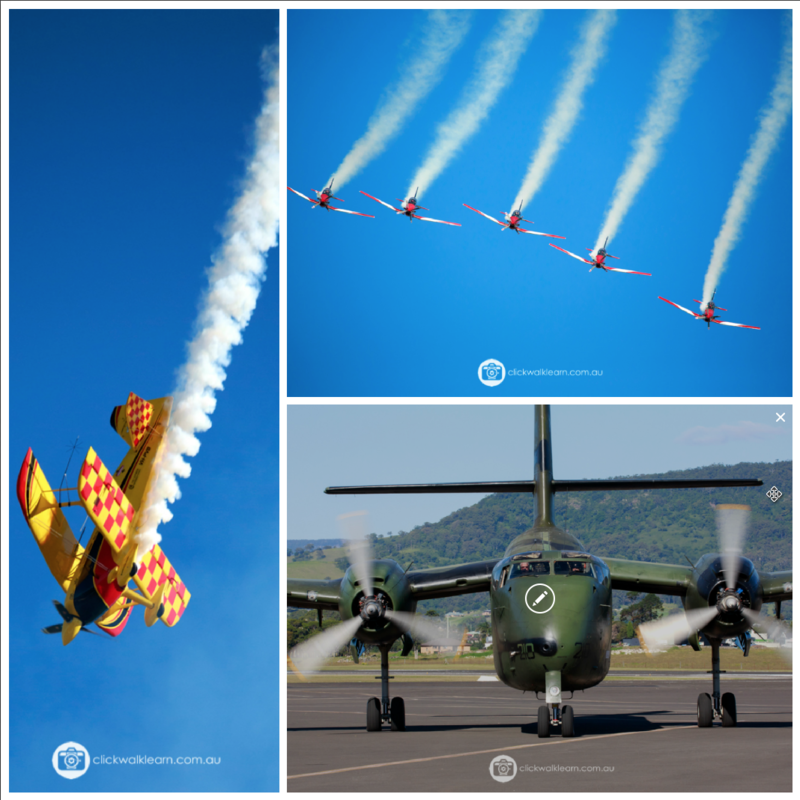 This years ‘Wings over Illawarra’ airshow is a fabulous opportunity to not only see and photograph some great flying displays, but to photograph many of these amazing aircraft, past and present, static, at close range. There is so much for you to photograph at this years show – Free style motor cross displays, classic car displays, displays by the Australian Airforce, Army & Navy. Among the static displays will be many of the Historical Aircraft Restoration Society’s aircraft. This beginners tour is designed to teach you absolutely everything about general photography AND fast movement photography at this fantastic yearly event! 8 hours of photography tuition. The click walk learn photography ebook. This will be emailed to you 7 days before the tour along with specific tour details of where to meet, transport options & parking etc. Critique of a selection of your images on the click walk learn facebook page. Please note you will need a zoom lens plus a wide angle lens for this tour. If you have any questions, please ring Chris on 0430 511 566. Previous All new click walk learn photography tour dates – Hurry book now!